Robyn is Professor of Teacher Education and the Arts. She teaches in the areas of curriculum, English and drama, working with both undergraduate and postgraduate students. In the areas of English, iteracy and the arts, Robyn's research has particularly focused on the use of drama as quality pedagogy with authentic texts to develop students' critical literacies. She has been published widely in this area. 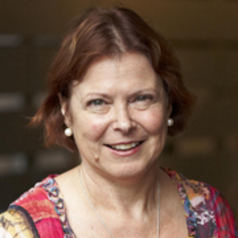 Her current research interests also include teacher education, especially the experiences of early-career teachers and the role of mentoring; the use of arts-informed inquiry in education research; sustaining curriculum innovation; and evaluation, inquiry and case-based learning. Robyn was president of the Primary English Teachers Association from 2001-2006 and is currently national president of the Australian Literacy Educators Association (ALEA) and vice president of Sydney Story Factory. Within the faculty, Robyn was inaugural co-director of the innovative Master of Teaching degree and has also been Acting Dean; Associate Dean, Academic Programs; Associate Dean, Teaching and Learning; Director, BEd(Primary); and Director, Division of Professional Learning. An experienced primary teacher and teacher educator, Robyn has a commitment to quality teaching and learning at all levels of education. She enjoys working collaboratively with classroom teachers interested in innovative curriculum practices. She has worked as an academic mentor with teachers at a range of Sydney primary and secondary schools with the major focus on improving literacy outcomes using drama and literature.